The Labour Party are demanding that we should put our small fishing boats first by calling for more fishing quota to be given to smaller fishing boats after Brexit – to provide a fairer deal for Britain’s hard-pressed fishermen. Help for small fisheries such as Hastings is missing from the Government’s current Fisheries Bill. But Labour amendments this week aim to tip the balance in favour of under 10-metre boat operators. The Government says it will take back control of British waters, but is silent on the future of our Hastings fleet and the country’s 4,000 other small boats. Whilst small boats represent 80% of Britain’s fishermen, their catch allocation is paltry: accounting for just 4% of the UK’s total fishing quota. And there is little chance this will increase under Tory plans. In contrast, Labour is demanding that quota be reallocated along social and environmental lines. The initiative was welcomed by Labour’s Peter Chowney, the Labour prospective parliamentary candidate for Hastings & Rye. “The UK fishing quota is allocated by the Government – and has been deeply unfair over many years, he said. 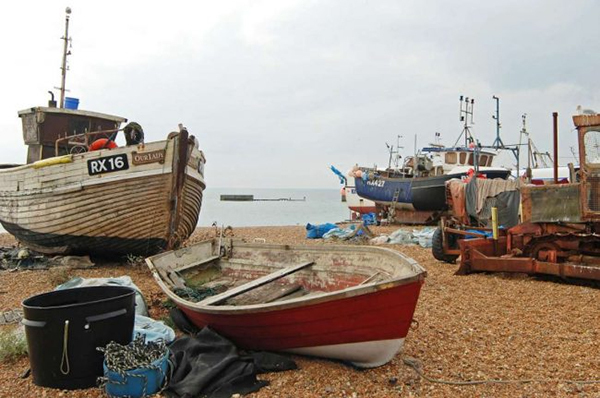 This had resulted in Hastings’ fishermen getting insufficient quota to make a living. Labour’s policy is a practical example of Labour’s policy of ’For the Many, Not the Few’. Across the country, small boats provide the bulk of jobs in the catching sector and contribute to coastal towns from Cornwall to the far north of Scotland, Northern Ireland to Kent. However, nearly a third (29%) of the UK’s fishing quota is owned or controlled by just five families on the Sunday Times Rich List. The Dutch-owned trawler, the Cornelis Vrolijk, controls more than a fifth of England’s entire quota allocation, while around two-thirds of the UK’s quota is awarded to three multinational companies. Luke Pollard MP, Labour’s Shadow Fisheries Minister, said: “By ignoring the needs of smaller fishing fleets, this Government is betraying British fishing. “Michael Gove could take action to redistribute fishing quota now if he wanted to – but he is failing by not delivering quota reallocation in the Fisheries Bill. Labour in government will set out a strong, credible and fair plan for the future allocation of new and existing quota by giving more fishing opportunities to small fishing boats, based on new social and environmental criteria, he added. Labour’s Shadow Defra team is also consulting on how to boost employment opportunities in ports and processing, and how to incentivise environmentally sustainable fishing methods. This article does not contain the whole picture. I would like to know what the last Labour government (mainly under Tony Blair) did to help the UK’s small boats during the years that it was in power, if anything. Perhaps Cllr Chowney would care to tell us. This problem has been ongoing ever since Ted Heath and co. were foolish enough to give away most of the quota for fishing in our waters because he was so desperate to get into the so-called ‘Common Market’, actually a highly protectionist and price-supporting organisation at the time. I hope someone will be able to find out what the figures were for the original split. This is where the big injustice was done. French, Spanish etc. boats have ruined our traditional fishing grounds by their use of too-small nets and taking undersized fish, before they were big enough to breed – yes, I have been on a French fishing boat, in 1970, and seen them landing far too small mackerel. What is worse, some of our quota has been sold to foreign-based and -crewed boats. I guess this is pure capitalist greed, and patriotism did not feature in the decision. Also, the UK /EU rules allowed this to happen. Why was this? All the UK’s governments from 1973 are to blame here, along with the EU. Whenever a country joins, it seems to experience price inflation; someone I know who was living in Cyprus when it joined found her shopping bill went up from £80 to £120. In the case of the UK, inflation was fuelled by VAT, then at a mere 8%. The same is likely to be true for leaving. The way in which ‘cheese will go up by 40% when we leave’, and similar figures, are bandied about (usually by vested interests), and not challenged in the media, annoys me. Recently, someone from ARLA (a dairy farmers’ co-operative) said to a BBC news/current affairs person on Radio 4, that if we left on World Trade Organisation rules, then 10% would be added to the cost of the 15% of the milk that they import for use in the UK; also, that the average delay for milk tankers would be 7 minutes at the port. Somehow, this transformed into a 40% price rise in milk, yogurts etc. for the consumer. The BBC person did not challenge this mathematical nonsense. 10% of 15% is a 1.5% additional cost in their total milk cost. Maybe this should be rounded up to 2%, including that short average delay at the port. Probably, the cost of the milk (including the 85% produced in the UK, which would be unaffected) is about half the total wholesale cost of the dairy products that ARLA produces. The rest of that supposed retail price hike of 40% is either profiteering or scaremongering. Where is the fairness? Where is the openness? Where is the truth?